Pakistani leg-spinner Yasir Shah made history once again, this time by breaking the Test record for being the fastest to 200 wickets on day four of the third Test between Pakistan and New Zealand. The list of the quickest to 200 wickets in Test Cricket has been dominated by spinners, and Yasir Shah is the newest addition to the list as he takes the top spot now. 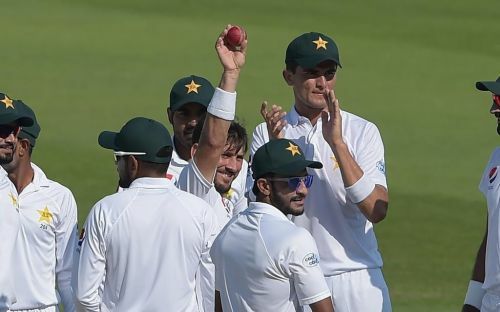 Yasir achieved this incredible feat when he trapped William Somerville in front of the wickets early on day four of the third Test against New Zealand in Abu Dhabi on Thursday. The 32-year-old broke Clarrie Grimmett’s record which he set 82 years ago for Australia in his 36th match in February 1936. Yasir took three fewer matches and achieved the feat in only his 33rd match which clearly speaks of his caliber and temperament. Legendary spinners Shane Warne and Muttiah Muralitharan each needed 42 matches to take their respective 200th wickets in Test cricket. This shows just how impressive Yasir's impact has been in the world of Test cricket. With the start he has gotten, and only 33 matches deep, Yasir still has at least 4 years of cricket left in him and since he took 4 years to take his first 200 wickets, it seems as though he will be breaking even more records going forward. Yasir now joins the top 5 men who’ve achieved this feat in the least matches at the top, with fellow countryman and fast-bowling legend Waqar Younis slipping down to the fourth spot. After his remarkable achievement, his fellow countrymen erupted with joy and expressed their views through Twitter where they praised his efforts and talent. His Pakistan Super League team was one of the first to congratulate the superstar, as they tweeted out an interesting post for him through Twitter. Presenting to you "Raftaar Shah"
Following the trend, many more news agencies, teams, journalists, former legends, and fans took to the social media platform to congratulate Yasir on the achievement in their own unique ways. In their first 33 Tests, Shane Warne had 162 wickets while Muttiah Muralitharan had only 135 wickets. Yasir Shah now has 75 wickets in his last 10 Tests. Congratulations, Yasir Shah on setting new record of fastest bowler in test cricket to get 200 wickets in 33 matches. He got this milestone in 4 yrs 42 days. Previously Waqar Younis was the fastest Pakistani who got this v New Zealand Christchurch in 6 yrs 23 days in 38 matches. Pakistan dealing in world records in 2018 across formats.